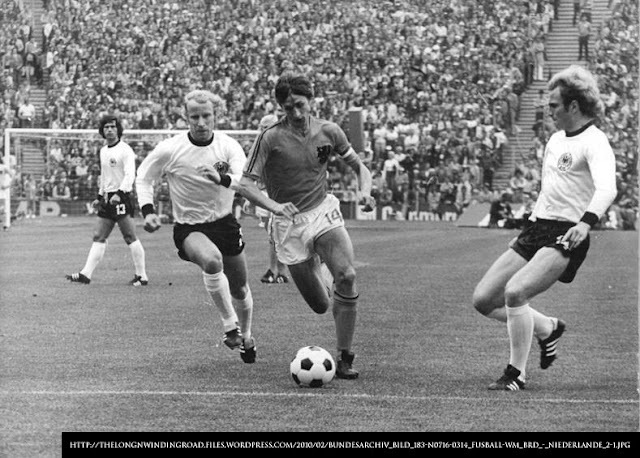 The term total football was something that mediamen coined to describe the playing style popularised by the successful Ajax Amsterdam sides of the early seventies and which Michels likewise used with the Dutch national team that finished runners-up in consecutive World Cups also in the seventies. Prior to the era, football as it was conventionally played meant that it was very structured; i.e. players were given definitive roles and were expected to stick to these roles for the duration of the match. Hence, defenders were defenders; midfielders were midfielders; and forwards were forwards. Against the Dutch, conventional teams were belatedly discovering that they were up against a team that had little respect for conventional structures. Defenders were often distraught to discover that the players that they were assigned to mark had taken up positions elsewhere. Michels’ innovative new playing style – anchored both at Ajax and with the national team on Dutch genius Johann Cruyff – threw conventionalism out the window and asked players to perform tasks other than their specialities or those that they were assigned at the start of a match. Thus, fullbacks could be found suddenly in attacking positions high up the pitch while forwards could drop deep into defensive areas. The ploy was particularly confusing for opposing teams which played the conventional marking systems. Prior to the introduction of this playing style, life was immeasurably simpler for defenders. Marking assignments were given at the start of each match and defenders were expected to stick to their assigned opponents. It was this non-stop inter-changing of positions that seduced the media into coining the term total football. However, Michels himself explained the catalyst for this inter-changing. Conventional teams, when they lost possession, withdrew into their own halves to consolidate formation at the back and limit playing space for the counterattack. Quite the opposite, instead of retreating upon losing possession, Michels wanted the player who lost the ball to press forward to attempt to win it back. Thus, said Michels, he preferred the term pressing football instead of the term that had become popular in media. Inevitably, if a defender or midfielder pressed forward chasing after the ball, a hole would be created where he used to be. In Michel’s system, the hole was quickly plugged by the nearest player; and the entire team adjusted on-the-fly. Once possession was regained, instead of players retreating to their original positions, they kept on playing in the areas that they were in when the ball was won back. Part of the ploy required using a high defensive line to constrict the space that opponents could play in and, therefore, make it easier for the pressing to give possession back to the Dutch. When possession was regained, the team held onto the ball using short simple passes until openings could be found. As when pressing for the ball, players were at liberty to keep exchanging positions while the team probed for openings. Michels was the first to admit that the style was not for everyone and recognised its limitations. First, the players had to be not only extremely intelligent but also have the ability to play on the same wavelength. Since continuous movement and exchanging of positions was expected, for just one player to lose focus meant that the team immediately lost its balance. Second, every player on the field needed to be well-versed in the vastly different arts of attacking and defending. In other words, every player needed to be as comfortable in making sliding tackles as he was in taking shots at goal. Because the team played a high defensive line, it goes without saying that speed was expected of each player; else the team would have been vulnerable to swift counterattacks or balls played over the top. Finally, since possession football was also part of the ploy, then every player needed to have high levels of awareness in tight spaces as well as the ability to consistently make precise passes. For Michels – and Holland, of course – there were no concerns about players as the Dutch enjoyed almost an unfair wealth of world class players, plucked primarily from Ajax and its bitter club rival Feyenoord. 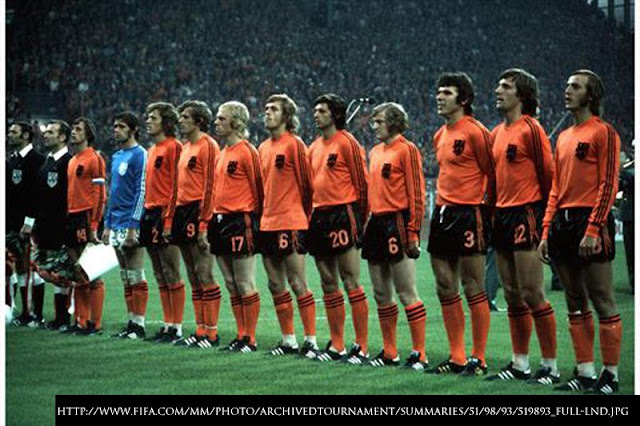 Apart from Cruyff, other household names among the Dutch team of the era were Johann Neeskens, Wim Jansen, Wim van Hanegem, Arie Haan, Robbie Rensenbrink and Johnny Rep, to name just a few. The concepts expounded on in this article are now bread and butter for the top teams around Europe, notably Barcelona – with whom both Michels, Cruyff and other Dutchmen were subsequently associated down the years. The next time that you watch Barcelona – or even the Spanish national team, which benefits from a preponderance of players from the Catalan club, spare a thought for the late Dutch genius Rinus Michels, who had a lot to do with the way the team plays. Some call it total football – and its possession side the Hispanised tiki-taka. Remember that the person who developed the playing style really thought of it more as pressing football.